Fire is the main disturbance agent in boreal forests. 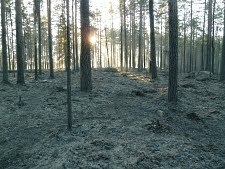 Since the beginning of the intensive forestry, fire suppression has been effective, and it has resulted into the loss of boreal forest biodiversity. 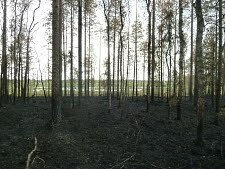 Fire is used as a restoration method, as it increases the amount and variability of dead wood and the diversity of tree species, which are essential factors for the diversity of red-listed forest species. 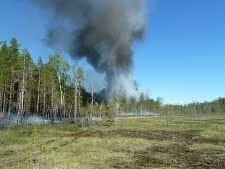 Niittysuo–Siiransuo area is one of the 52 fire continuum areas in Finland. In these areas the goal is to ensure the temporal and spatial continuity of forest fires to maintain populations of fire dependent and fire favoured species. Forests in Niittysuo–Siiransuo area were commercially used until 1980´s. The area has now been proposed to Natura 2000 network mostly due its large, undrained aapa-mires and bog woodland. Pine-dominated, mid-aged, previously commercial forests will be visited in Niittysuo-Siiransuo area. The forests have been restored to increase the variability in the tree stand structure and to create dead wood for red-listed dead-wood dependent species. The methods used here include controlled burning with and without fuel load, and dead wood addition. Natural aapa mires will also be visited as well as a small restored peatland, in which it is possible to see dammed ditches, which restore the water table level. More information of restoration: Guide for forest habitat restoration and management, pages 20-44 (in Finnish).